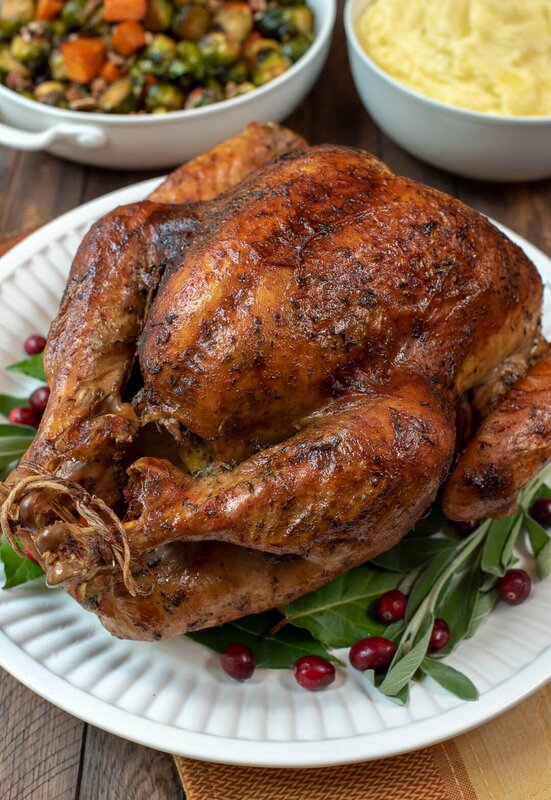 The process of dry brining creates this incredibly tender, juicy turkey with beautifully browned, crispy skin. 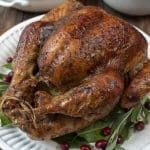 This Dry Brine Turkey with Garlic Butter Rub will make a gorgeous centerpiece for your holiday table. I’m so excited about this dry brine method, guys. 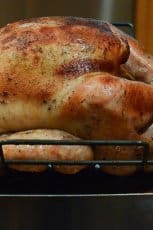 I’ve been roasting my turkeys in pretty much the same fashion for most of my life and yesterday I decided to give this dry brine method a try and I was seriously blown away by the result. I know I’m a bit late getting this out to you but if you don’t have a definite plan for your bird yet, I highly recommend you give this method a try. 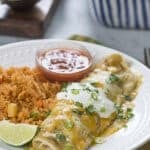 I’m super attracted to make-ahead recipes for my holiday menus and one of the most exciting aspects of this recipe is that you will get all the messy turkey prep out of the way up to 3 days in advance of Thanksgiving Day. 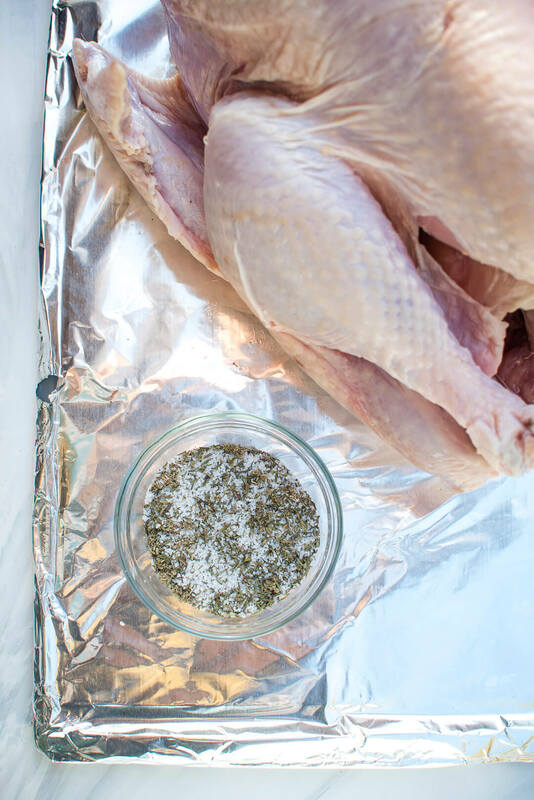 Dry brining is the process of applying a dry rub consisting of coarse salt and seasonings to a cut of meat, in this case a whole turkey, and then allowing it to rest in the refrigerator for two or three days. The salt works to draw out the turkey’s juices and then the salt dissolves in the juices. It’s all reabsorbed back into the turkey to help break down the tough muscle proteins. A little scientific but a lot AMAZING. The result – a bird that is succulent, juicy, tender, and flavorful. Resting uncovered for at the last part of the chilling time dries out the skin a bit, resulting in that beautifully browned, crispy skin you see in the images in this post. This dry method is SO much cleaner and easier than a wet brine and I believe the result is at least as good if not better. Plus, it eliminates the need to hunt down a container large enough to accommodate gallons of water and a big turkey. Not to mention the refrigerator space. 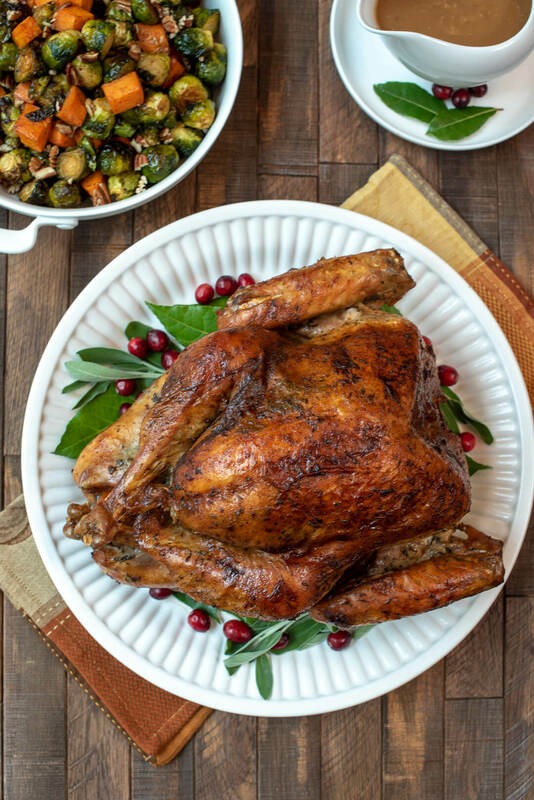 You can start the process up to 3 days in advance of Thanksgiving and when the big day arrives, your turkey will require only a minimal amount of remaining prep before you pop it in the oven to roast. Either a fresh or frozen turkey will work but it is important to select a natural turkey that has not been injected with a salt solution. As much as I love Butterball turkeys, they should not be brined. You also want to avoid Kosher turkeys which have been pre-salted. Read the package and select a natural turkey that has been minimally processed. If salt is listed as an ingredient, keep looking. If you are unsure, talk to the butcher at your local grocery store and they should be able to steer you in the right direction. I picked up my 13-pound turkey from Whole Foods. They had the best selection of minimally processed turkeys in my area. It takes approximately 1 day (24 hours) per 4 pounds to thaw in the refrigerator, so, for instance, if you have a 16 pound turkey, it will take 4 full days to thaw completely. 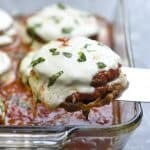 Place it on a rimmed baking sheet before placing it in your fridge in case any juices escape the packaging while thawing. 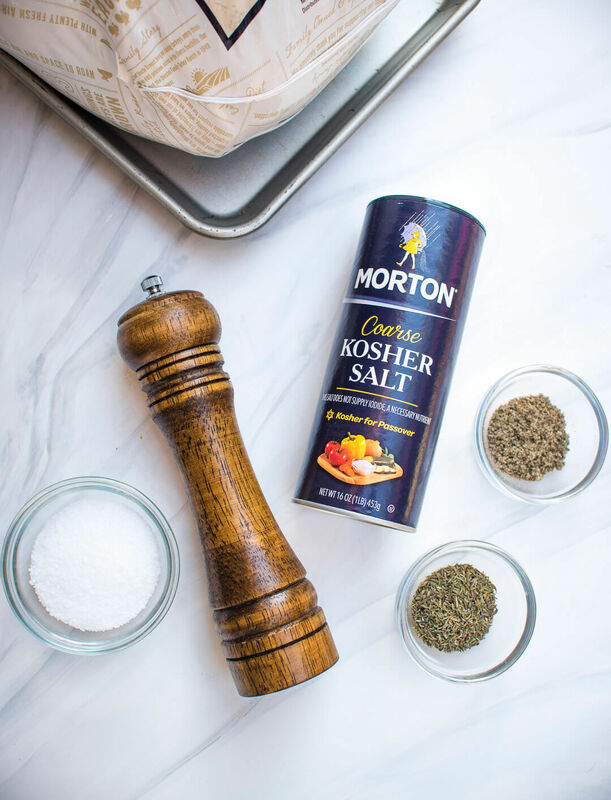 You’ll see a variety of ingredients included in dry brine recipes including seasonings, sugar, and even citrus zest but the main and most important ingredient is coarse kosher salt. Salt alone will do the trick but in addition I included freshly ground black pepper, dried thyme, and dried rubbed sage to infuse some herb-y flavor. I opted to add citrus to the cavity of my turkey (see below) so it is not included in my brine. At least two and up to three days before you plan to roast your turkey, remove the completely thawed bird from the packaging and remove the giblets. There is no need to rinse the turkey with water and in fact, it is not recommended for food safety concerns. Just pat the cavity and outside of the turkey dry with paper towels. I like to work on a foil lined board for easy cleanup. Combine the dry brine ingredients in a small bowl. Sprinkle some of the dry brine inside the cavity and use your hands to spread it around. Then carefully lift up the skin covering the breast meat and spread some of the brine directly on the meat under the skin. The remaining brine should be spread over the exterior of the bird. Transfer the seasoned bird to a rack in your roasting pan or a large rimmed baking sheet (whatever fits best in your fridge). Cover it tightly with plastic wrap, transfer it to the fridge, and go about your life! 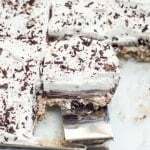 It should be refrigerated, covered, for one to two days. Two days is better if you have enough time, especially if you are roasting a larger bird. At this point you’ll remove the plastic wrap and let it chill in the fridge for at least an additional 8 hours or for up to 24 hours. This helps the skin dry out a bit and will result in that gorgeous browned, crispy skin. If you are like me, you’ll need to set a reminder on your phone to remove the plastic wrap. I am seriously overloaded the day before Thanksgiving so my brain is not exactly running on all cylinders. When the big day arrives be sure to remove the turkey from the refrigerator and let it rest for 45 minutes to an hour on your kitchen counter before roasting to take the chill off. Don’t rinse the turkey before roasting. Don’t do it! This will defeat the whole drying process and you won’t get that nice crisped skin. The salt will have been absorbed and done it’s job and the turkey will not taste salty. Add any variety of aromatics you’d like to the cavity of the turkey before roasting. I went with onion, carrot, and a quartered orange. Lemon, fresh herbs, and celery are also wonderful options. The last step before roasting is to slather the bird with a mixture of softened butter, olive oil, and granulated garlic. 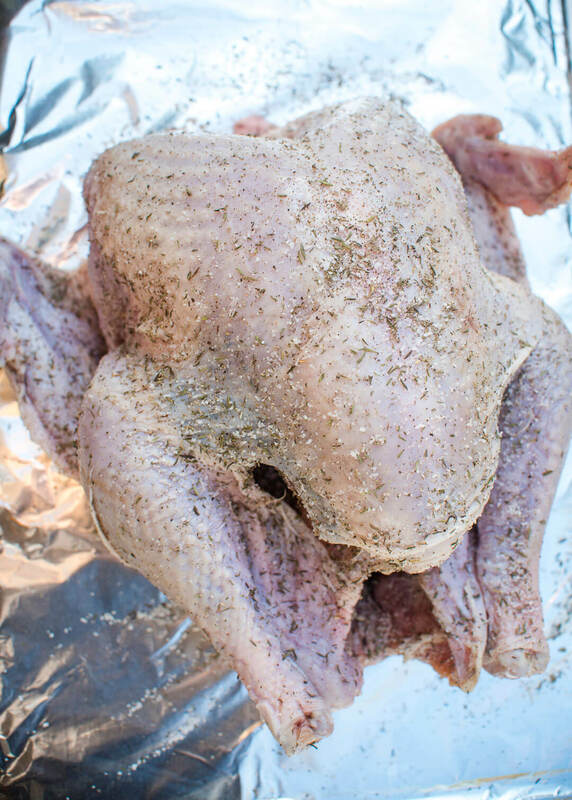 The garlic butter rub goes both under the skin of the breast portion and all over the exterior of the turkey. Roast the turkey at 325 degrees F for about 12 to 15 minutes per pound, to an internal temperature of 165 degrees F when measured in the thickest part of the thigh. Brined turkeys can have a tendency to cook a bit faster so watch it closely towards the end of the cooking time. You will need to have plenty of broth on hand since brined turkeys will not let off as much cooking liquid while roasting. This is a good thing because the juices stay in the bird! Add a couple of cups of chicken or turkey broth to the roasting pan before it goes in the oven. Baste the turkey often during the roasting process to encourage the skin to brown and crisp, adding additional broth when needed. I used an entire 32 ounce carton of chicken broth. 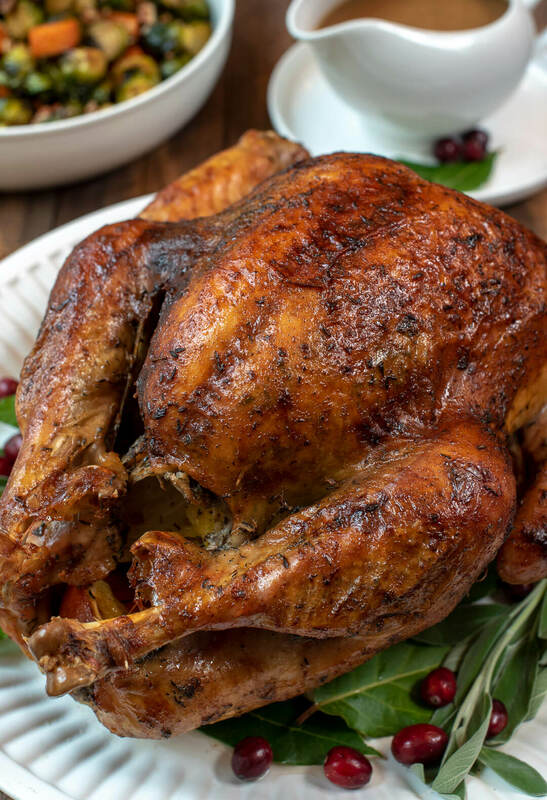 Once you pull it from the oven, tent the roasting pan with foil and let the turkey rest for 30 minutes before carving to help the turkey retain as much of the juice as possible. 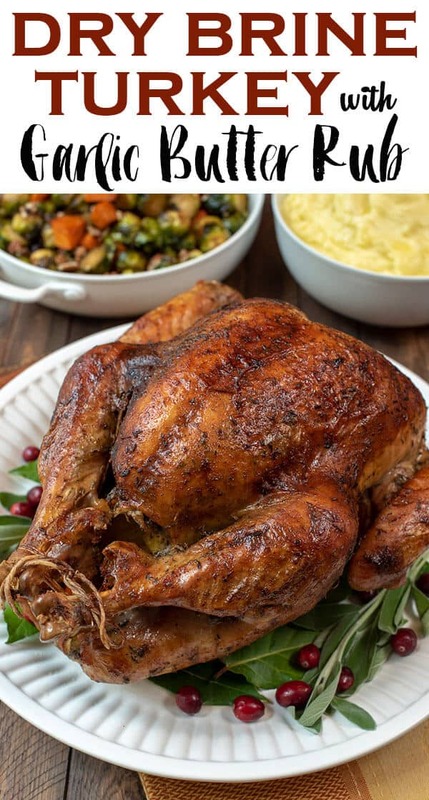 For more general turkey info, check out my post on How To Choose, Prep, and Roast your Turkey. 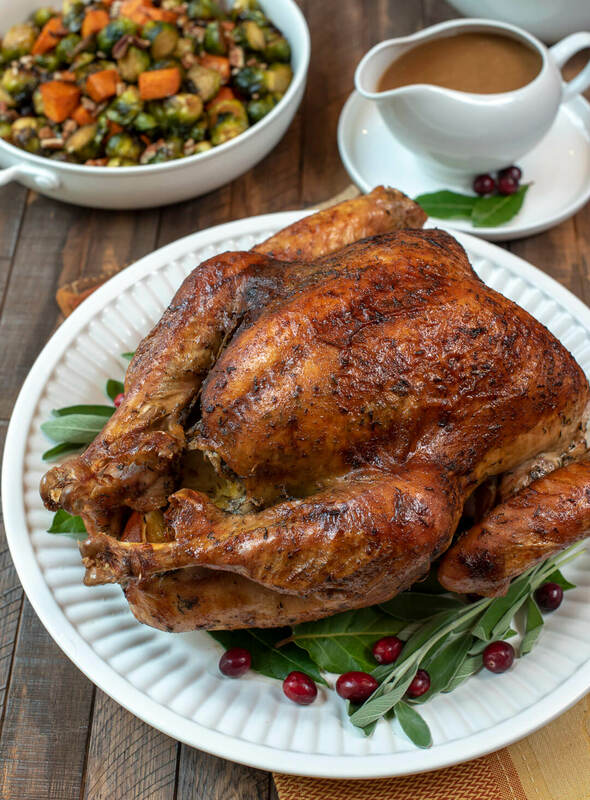 If you don’t have time to brine this year take a gander at my detailed instructions for my Herb Roasted Turkey – a more traditional method of preparation that works wonderfully with the beloved Butterball Turkey. And, finally, the gravy and stuffing! 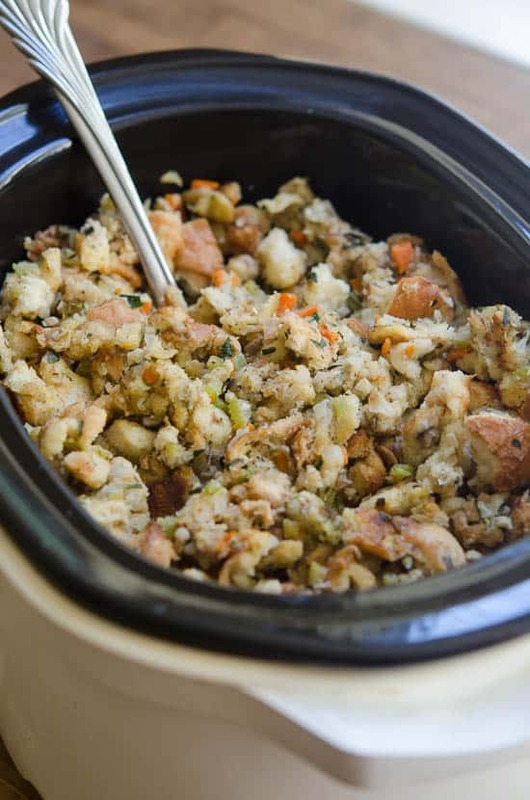 This recipe works perfectly with my recipe for Easy Turkey Gravy and the most delicious Crock Pot Stuffing ever! I wish you all a festive Thanksgiving and a fabulous feast. I’d love to hear what you’re making so feel free to comment or drop me a line. 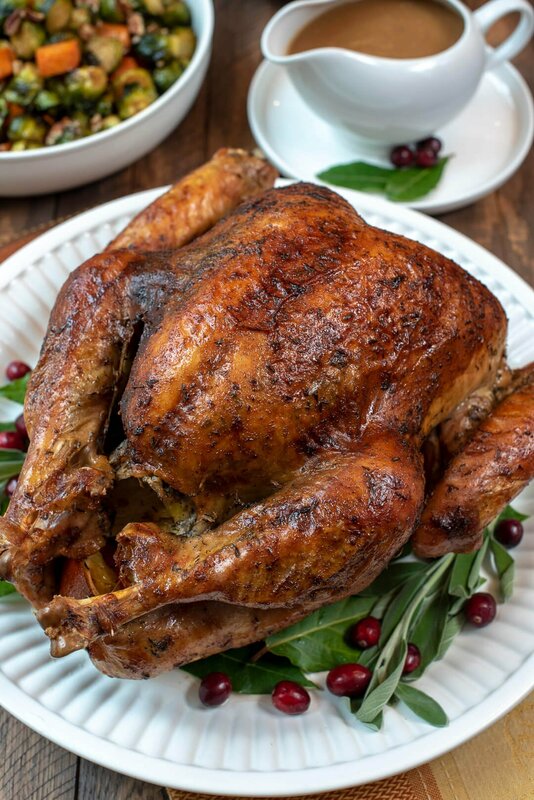 The process of dry brining creates this incredibly tender, juicy turkey with beautifully browned, crispy skin. 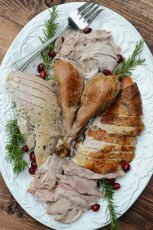 This Dry Brine Turkey with Garlic Butter will make a gorgeous centerpiece for your holiday table. Remove the packaging (in or next to sink) and remove the giblets. 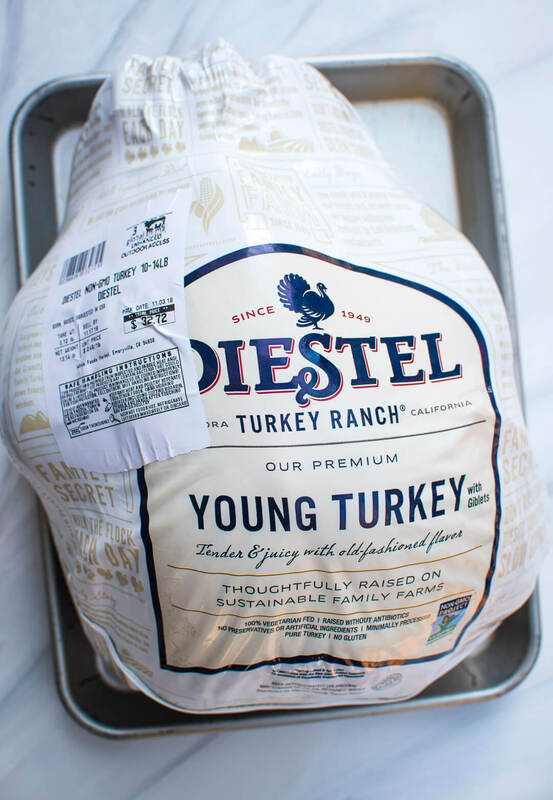 Transfer the turkey to a large sheet of heavy duty foil for easy cleanup. Pat the cavity and exterior of the turkey dry with paper towels. 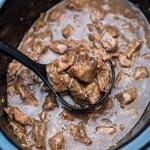 Combine the Dry Brine ingredients in a small bowl. 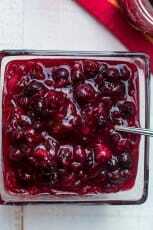 Sprinkle a few teaspoons of the dry brine inside the cavity and use your hand to spread it around. Gently lift skin on breast portion and carefully reach inside and coat as much of the breast meat as possible with a couple of teaspoons of the brine. Sprinkle the remaining brine all over the outside of the turkey. 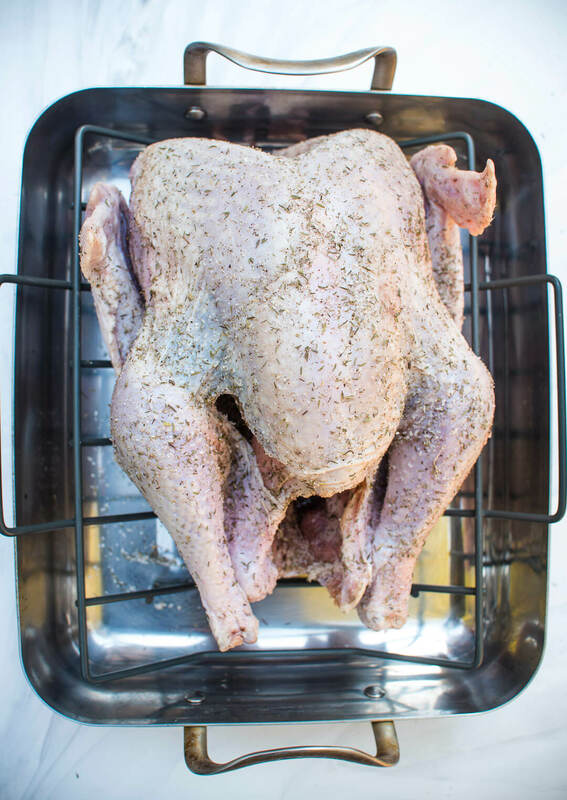 Transfer the seasoned turkey to a rack in your roasting pan (or a rimmed baking sheet). Cover it securely with plastic wrap - I used 5 or 6 sheets to cover my big roasting pan. Transfer the turkey to the refrigerator and forget about it for 24 to 48 hours. Remove the plastic wrap and let the bird sit uncovered in the refrigerator for an additional 8 to 24 hours. Remove the turkey from the refrigerator about an hour before you are ready to roast it. Stand the turkey up to pour out and discard any liquid that might have collected in the cavity and pour off or blot up any juices that have collected in the pan. Place the turkey back on the roasting rack. If you chilled your turkey on a baking sheet, transfer it to a rack in a roasting pan now. Preheat oven to 325 degrees F. Combine the butter, olive oil, and granulated garlic in a small mixing bowl. Set aside. Stuff the turkey cavity with the carrot, onion, and orange. Scoop up some of the garlic butter mixture with your hand and spread it under the skin of both turkey breasts. Spread the remaining butter mixture over the outside of the turkey, being sure to get into all the nooks and crevices of the wings and legs. Tuck wings securely under the body and use kitchen twine to tie the legs together. Pour about 2 cups of broth into the bottom of the roasting pan. Transfer the roasting pan to the preheated 325 degree oven. Allow the turkey to roast for about 45 minutes and then baste it once every 20 to 30 minutes or so throughout the remainder of the roasting time, adding additional broth if it begins to evaporate from bottom of pan. Rotate the pan in the oven about halfway through the cooking time to ensure even browning. Tent with foil once skin is browned to your liking. Roast until the internal temperature of the meatiest portion of the thigh registers a solid 165 degrees. The roasting time should range from approximately 3 to 4-1/2 hours if your turkey is between 12 to 16 pounds. Remove the turkey from oven, tent it loosely with foil, and allow it to rest for about 30 minutes before carving. Cooking time is approximate and will depend on the size of your turkey. Total time does not include brining time in refrigerator. This turkey looks and sounds AMAZINGLY delicious, Valerie! Beautiful! Thank you, Amy! 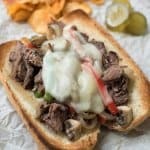 It’s on my Thanksgiving menu this year. Such a great method! Hi Amy. Your turkey has already been injected with a salt solution and does not need brining. 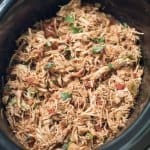 I would recommend going with my Herb Roasted Turkey or another similar recipe. I’ll never roast a chicken differently after using this recipe. It was fantastic, my wife and grandkids devoured the entire bird. THANKS! !